University of Louisville Vice President and Director of Athletics Vince Tyra announced Tuesday the resignation of Ken Lolla as head coach of the Cardinals men’s soccer program. Lolla submitted his letter of resignation to Tyra on Tuesday morning. “Thirteen years ago, God blessed Tina and I with the opportunity to come to Louisville and be a part of this amazing Cardinal family and the Louisville community. We are forever grateful for the acceptance, support, and love we have received from the Louisville community. It has been an honor and a privilege to represent such an outstanding institution and special community,” Lolla said. “Recently, we have received similar promptings from God that it is time to seek new challenges. We have always been faithful to those promptings and we will move forward faithfully, knowing there is a calling we are to fulfill. 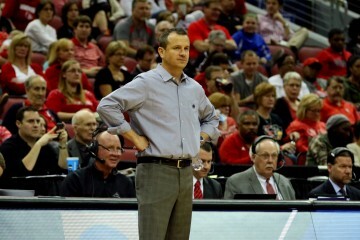 Lolla accumulated a 155-77-39 record overall while leading the Cardinals to 11 NCAA Championship appearances during his 13 seasons as head coach. Lolla guided Louisville to one College Cup berth as the national runner-up in 2010 as well as five total NCAA quarterfinal appearances. The Cardinals registered their first ACC Championship title in 2018 before ending the season with an 11-5-3 record overall after a second round loss to Michigan State in the NCAA Championship.